You may have noticed that there is no “King” in this title. That’s obviously because we all know that King Kong was killed in New York in the 30s, so obviously this is his first cousin, or some other distant relation, who shares the family name. That said, they go to great lengths to inform us that he is king of the titular Skull Island – a place that has somehow managed to pretty much stay off-radar until 1973. However, when a motley crew of misfits, comprising both military and civilian contractors, are employed to accompany representatives of a mysterious agency called Monarch to the uncharted territory, you just know they will end up wishing it had stayed undiscovered. Or else it would be a very short movie. Anyhow, having crash-landed, and finding themselves divided into separate groups, they must try and make their way off the island. Thankfully, they had employed a tracker in the form of Tom Hiddleston’s James Conrad. Apparently, he has a mysterious SAS past, and all that training clearly taught him that when entering uncharted jungle territory, where you could encounter all sorts of nasties, all you need is a pistol and a tight t-shirt, as well as your trusty lighter, handed down from your father. Clearly Brie Larson’s photographer character, Mason Weaver, undertook the same training course, as she enters the hot, sticky, and unforgiving jungle wearing nothing but a white vest top, and her camera, with not even a jacket in which to carry spare batteries and film (although she seems to have plenty). She also has the foresight to be a brunette, clearly having heard that Kong has a thing for blondes, and as such she doesn’t find herself the object of his affections, which is just as well, as she and James do seem to have designs on each other. Thankfully, the soldiers are more appropriately dressed in full combat gear. Not that this helps them. The various groups all soon discover that Kong is the least of their worries. They’re helped in this revelation by John C. Reilly as Hank Marlow, who has spent 28 years on the island, having been shot down over it during WWII. He’s still just the right side of sane, and tells them all they need to know about the mysterious location. As James and Mason come to respect and understand Kong, Samuel L Jackson’s Lieutenant Colonel Preston Packard isn’t nearly so understanding. After all, that great ape killed his men. So of course he has to seek revenge, despite the fact they are racing against time, and trying to avoid all manner of oversized and unusual nasties who inhabit the island. If this all sounds like bonkers fun, that’s because it is. From the off, this movie doesn’t take itself too seriously. There is no big build-up to the reveal of Kong, as filmmakers clearly know that audiences are familiar with the character. Therefore they get stuck right into the action, and from about 15 minutes in this doesn’t let up. Completely tongue in cheek, many of the laughs come from Reilly, whose character is literally stuck in a moment, and can’t even comprehend the world that awaits him, should he ever get off the island. He’s also one of the only characters we get any real insight into, as the focus here isn’t on character development, but rather moving the action along. This owes much to the 1933 version, and there are plenty of homages, from the look of Kong, to a scene where he finds himself wrapped in chains, reminiscent of how he breaks free in Radio City Music Hall in the earlier flick. There are also plenty of homages to other movies, and geeks will find this a veritable smorgasbord of references. For those not so nerdily-inclined, there is still plenty to enjoy here if you are just looking for a rip-roaring fun monster-movie, with a smattering of nostalgia thrown in. 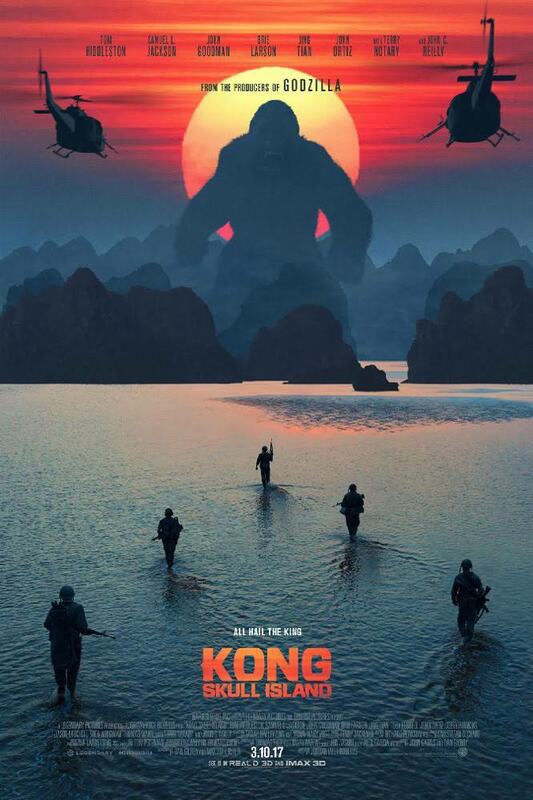 It doesn’t have the heart of the original – or indeed of the Peter Jackson remake – and this Kong feels more like a big rage-monster than the more sensitive soul portrayed in the other two movies, but who cares? This is a lot of fun, and is a thoroughly entertaining two hours.